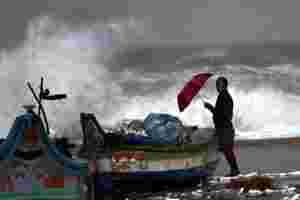 Chennai: Rain and gale force winds lashed India’s southeast coast on Friday, bringing down walls and power lines and killing at least six people as cyclone Thane made landfall near the industrial city of Chennai. The storm quickly lost strength over land, with winds dropping to 75 kph (46 mph). “There have been six cyclone-related deaths in different villages in this area mainly due to wall collapses or electrocution," said V. Amuthavalli, an official in Cuddalore district, one of the worst-hit areas in Tamil Nadu. “Our priority right now is to restore power supplies and other infrastructure problems which have been damaged." Heavy rain was expected to last for 12 hours and the strong winds would weaken to about 45 kph (27 mph) by the end of the day, it said in its latest bulletin. India’s cyclone season generally lasts from April to December with severe storms often causing dozens of deaths, evacuations of tens of thousands of people from low-lying villages and widespread crop and property damage. In 1999, a “super-cyclone" battered the coast of the eastern state of Orissa for 30 hours with wind speeds reaching 300 kph (186 mph). It killed 10,000 people. According to the UN’s Global Disaster Alert and Coordination System, up to 1.2 million people live in the affected area, with almost 80,000 in low-lying coastal areas. “Some roads have been blocked due to trees being uprooted by the strong winds, and electricity supplies and phone lines are also out in the worst-affected areas," said Joseph Sahayam, emergency officer for the Churches Auxiliary for Social Action. “Mud and thatch homes along the coast are also believed to have suffered some damage."